Which Security Cameras Should I Add to My Virginia Home? In our last blog on security and surveillance we talked about the importance of having cameras, smart locks, and an automated system. But do you know that the system also has to be high quality in order for it to secure your Virginia Beach, VA property? You can’t just pick any security camera and hang them on your doorstep. Today there are many different types of cameras, and we can be your local expert and guide you on choosing the right ones for each crucial location in your house. Stick around after the jump for more. These types of cameras are dedicated to capturing one specific area, so they don’t move an inch. Some benefits of using this type is that you can monitor an important area constantly, and they are also very reliable and require less maintenance. We recommend placing them near a door or window – entryways where a person could break in. PTZ means “pan, tilt, zoom” and you can understand why. These cameras do the opposite of the fixed ones; they survey a broader area by moving to different points and zooming in and out on objects. Not only can these cameras cover a greater range, but they also respond to your command to look closer at an area or individual. In addition, they allow you to customize the settings and make the cameras survey and area for specific time frames, such as only at night and when you are at work. The drawback to this type of camera is that since it moves it could miss some crucial activity. These might work best in a bedroom or pool area. Instead of focusing in on one set location, or moving around periodically like the PTZ cameras, these can capture the entire room in one shot. All of the recorded images are combined for a full and continuous view of one large area. Often, these cameras will allow you to zoom in on the picture after the fact. 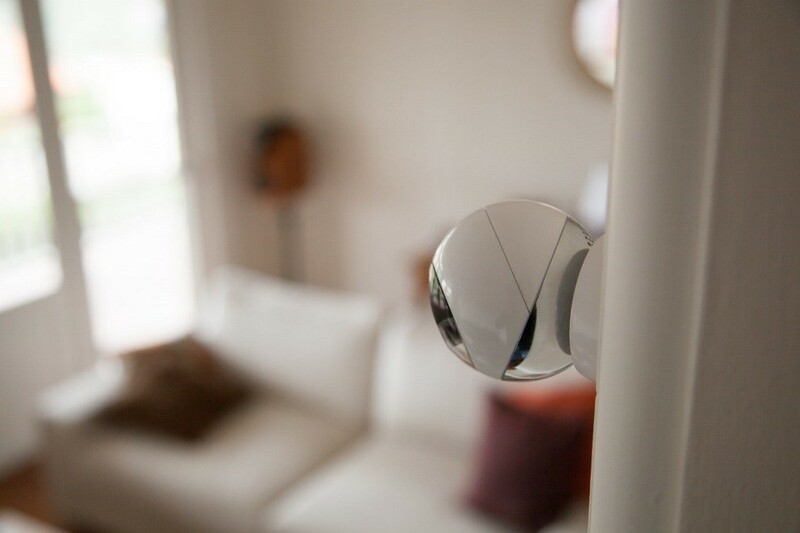 A professional will be able to place these cameras in the best locations to properly record entire rooms or outdoor areas. Another aspect you want to consider when purchasing cameras is will they be hidden or out in plain sight? There are benefits to both. A fixed camera is usually large and in a cylindrical shape so they are obvious and could deter intruders for fear they will be caught on camera. A hidden camera on the other hand can’t be tampered with or destroyed so they’ll always capture the intrusion. Some discreet cameras are made to look like smoke detectors or motions sensors. Dome cameras are still out in plain view, but the stranger won’t know exactly where the camera is recording. Lastly, you’ll want to consider how you are going to access and store the video footage. Most modern surveillance systems store the videos on a cloud. It’s a secure environment and easy to access and maintain. To avoid having to browse through hundreds of hours of clips, your camera could only record when it detects movement. You’ll also get an alert on your phone when something approaches your house. Some cameras are also pet friendly so they don’t bother you by letting you know that your dog just chased a squirrel in the backyard. At the end of the say, the best choice is to work with a local professional in the Virginia Beach, Virginia area like us. We can customize your system and help you select the best cameras for every crack and crevice of your home.